Instead of storing user credentials of an external system in a configuration file, you should store them in the Azure Key Vault. Before MSI (Managed Service Identity) you would have to store the credentials to use the key vault in the configuration file so this wasn’t really helpful. With MSI (Managed Service Identity) you do not have that problem anymore. A system assigned identity: When the identity is enabled, Azure creates an identity for the instance in the Azure AD tenant that’s trusted by the subscription of the instance. 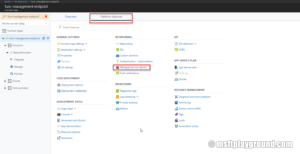 After the identity is created, the credentials are provisioned onto the instance. The lifecycle of a system assigned identity is directly tied to the Azure service instance that it’s enabled on. If the instance is deleted, Azure automatically cleans up the credentials and the identity in Azure AD. A user assigned identity: is created as a standalone Azure resource. Through a create process, Azure creates an identity in the Azure AD tenant that’s trusted by the subscription in use. After the identity is created, the identity can be assigned to one or more Azure service instances. The lifecycle of a user assigned identity is managed separately from the lifecycle of the Azure service instances to which it’s assigned. The main difference between the two forms is that this system assigned identity will exist as long as your application exist. The system assigned identity will also not be visible within the Azure Active Directory blade under the applications. Click “On” and click “Save”. In the background an Azure Application is created. Give the application the proper rights on the service you would like to use. 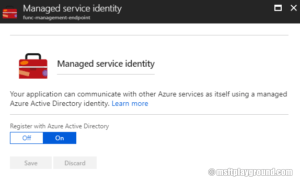 When developing an Azure Function and start on your local machine, you also want to use the Managed Service Identity. But how do you do that? You do not have a Managed Service Identity on your local machine. But you do! Visual Studio uses the credentials of the logged in user of Visual Studio. So If you make use of the MSI while debugging locally make sure the user that is logged in into Visual Studio has the proper rights within Azure.